Valerie D'Amour posted an emotional victory on Saturday in what was her first start since her owner Kym Darrouzet passed away. Darrouzet was a dear friend to all at the stables and often treated the staff with her homemade chicken pies and sandwiches. She was passionate about her animals as well with the horses no exception and incidently names Valerie D'Amour after her mother. 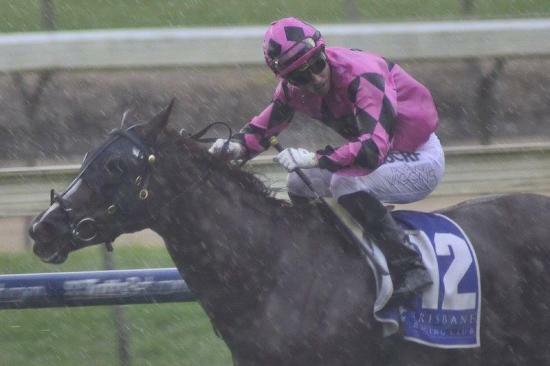 Valerie D'Amour headed to the start on Saturday with the threat of storm and as she turned into the straight lightening struck down onto nearby Nudgee Road. Rider Ryan Wiggins allowed her to stride to the front at the 1200 after being posted wide and from there she was never headed. The five year old NZ bred mare went to the line one and a half lengths clear of nearest rival Tips and Tales. Barry was quite emotional post race and rapt he could get the win for Kyms family.